The creation of a Noh masks is a labor-intensive process that can take anywhere from a few weeks to several months from start to finish. It begins with a block of about 1 foot square cubic malleable but durable wood. Utilizing special awls, saws, chisels and knives, the mask artist cuts the wood, hollows out the back of the mask and sculpts the facial features, initially roughly and then more finely. Several grades of sandpaper are also used in the final stages of carving and shaping. 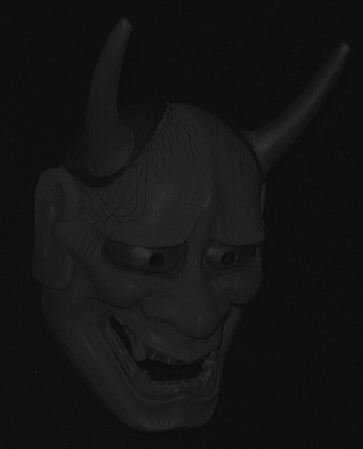 Eyes, ears, nose and mouth are positioned somewhat asymmetrically to give the mask a more life-like appearance. Once the mask is carved, the mask artist lacquers the back and prepares the front with about 6 coats of Gofun (Japanese whitewash). Skin shading is then applied by adding earth and flesh-toned pigments into the final coats of Gofun. Using special paints and fine brush, the mask artist outlines the eyes and paints the hair one strand at a time.